Save the Dates: 2019 National Conference & Theatre Tour, Philadelphia, PA, July 14-17. Registration will open by April 30. "We would not be where we are today as an organization without the education and peer support of LHAT. We wouldn't even have our new Membership and Marketing Director positions without the ideas and support of LHATand its members over the years." "As with every LHAT annual conference, it was a bountiful feast of information and lively interchange with theater experts, preservation specialists, fundraisers and fellow theater managers. The tours and networking opportunities are incredibly valuable, too. And the camaraderie among this group is unparalleled. Thanks for bringing us together each year--we're all the better for it!" "I am very thankful for such a great resource, the L-CHAT network has been so helpful to us at the Playhouse and me personally...I was able to make a great presentation to our board as a follow up to the Chicago and Tampa conferences with our key take aways and they were really happy...The sessions and networking at LHAT provided me with so much information and the contacts I needed." "The absolute BEST thing that she can do is join the League of Historic American Theatres (LHAT), the membership fee is worth EVERY penny. They have a FANTASTIC daily chat board amongst the members and you can also access their archives. The BEST most honest group for theatre information without any bias, they just truly care about all historic theatres and their restoration. Their annual conference is EXCELLENT too!" "The conference was very well-planned. The balance between the sessions, breaks, and tours was perfect. The location was wonderful and all the materials (and phone app) were so helpful. As a first-timer, this was such a fun experience and I came out of it with so much knowledge. Thank you!" If you require information with regards to an article please contact Ken Stein at 443-640-1058 x1123. 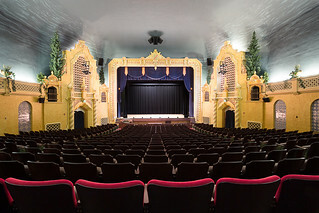 If you are interested in a list of Historic Theatres, visit our Historic Theatre inventory page. If you have a historic theatre and you want to get it open, this is for you! Our members have access to best practices to make their theatres better. Let us help you make your theatre better, too. Over 300 Historic Theatre operators from coast to coast are standing by. Ask a question. Get an answer. Check out this new job listing for a Executive Director with the Historic West Bend Theatre in West Bend, WI. Look Who Just Joined LHAT!